A small takeaway place tucked in the corner of the lane next to Model House, Punjagutta, it is not very easy to locate. But during lunch and dinner, you will find a small crowd jostling with each other to have a look at the items prepared on that day and place their orders. This place may be small, but they have a very dedicated clientele. They do not offer in house dining, you can only take away parcels from here. 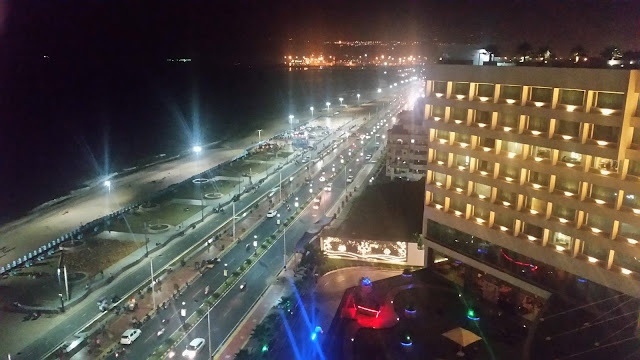 The parcel service serves Coastal Andhra cuisine with lots of seafood preparations. All the items are neatly displayed inside a glass counter, so that you can see them before placing the order. It is thus, easier for persons outside Andhra Pradesh who are not familiar with the item names as they can point and order. One of my favorites here is the Kamju Fry -soft and crunchy fried quails in a bed of spicy masala. This is a fast moving item in this takeaway and usually not available after 7 PM. Each bird costs about Rs 60. The Chicken Fry Biryani (which is basically Andhra Pulao) has hot and spicy chicken fry pieces served on a bed of bagara rice. 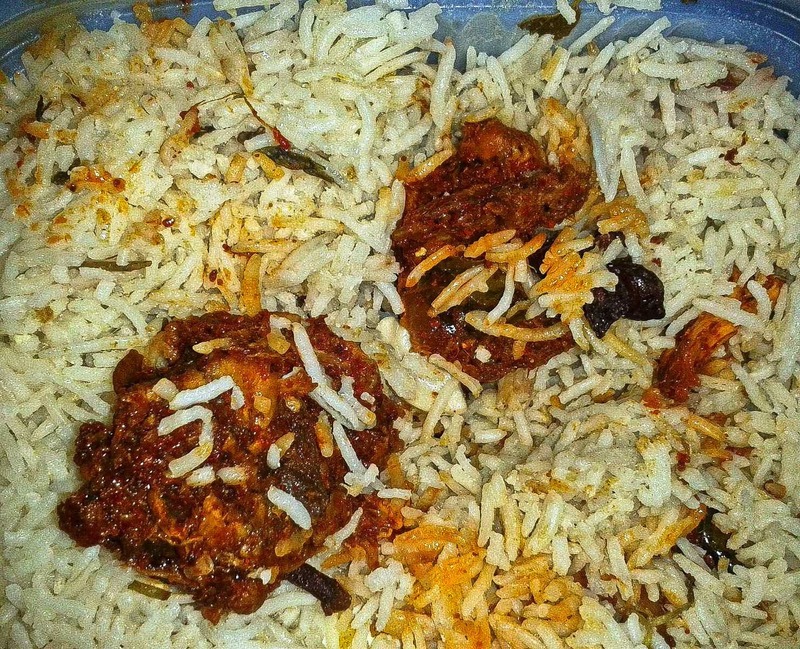 The rice has the aroma of clove and cardamom and other spices in which it is prepared. 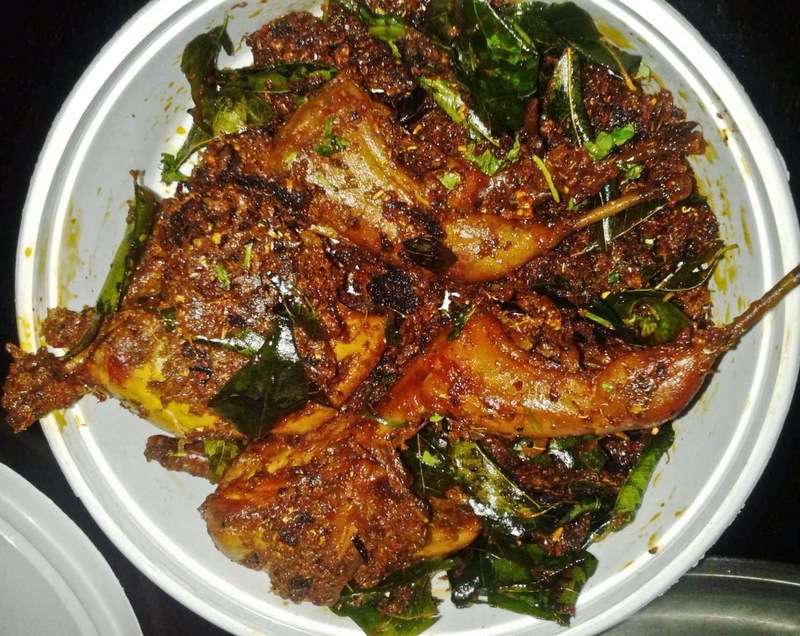 A copious amount of red chili paste or powder goes into the Chicken Fry making it delightfully spicy. The Chicken dish can also be savoured on a standalone basis. Apart from this, the Mutton Keema Biryani here is also very popular. For vegetarians, Vegetable Biryani is also available. A plate of biryani can normally serve two people. 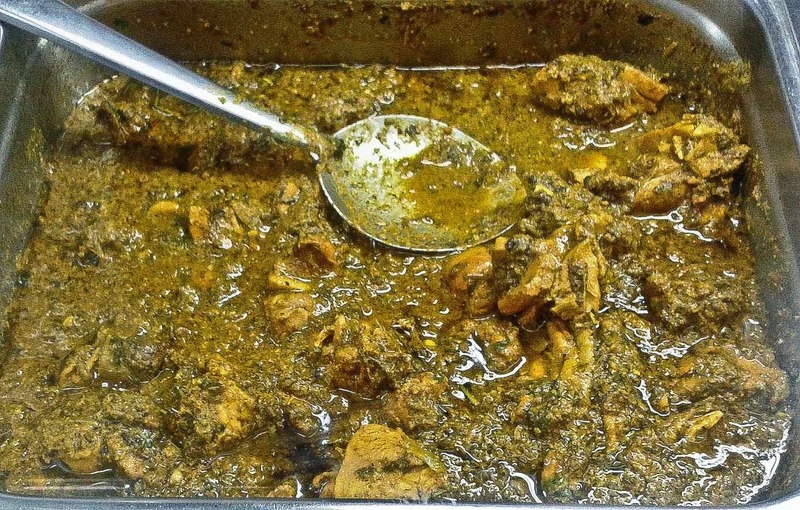 I particularly like the taste of the salan which comes with the biryani – spicy and distinctly different. 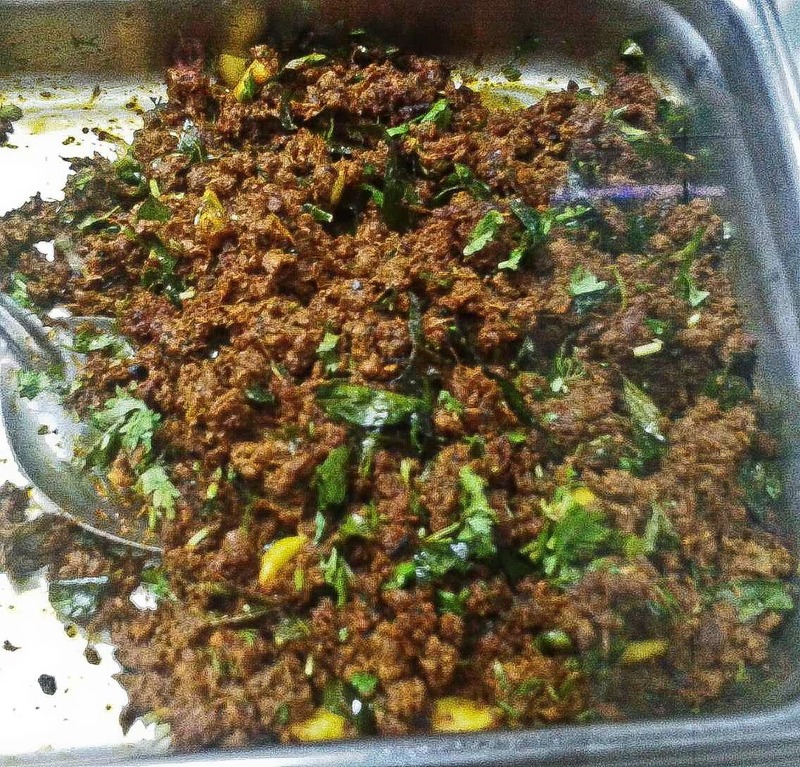 Again, you can buy the keema or mutton fry pieces standalone without going for the biryani. The seafood of Sri Kanya is also something not be missed. The crab roast and prawn masala are well appreciated. 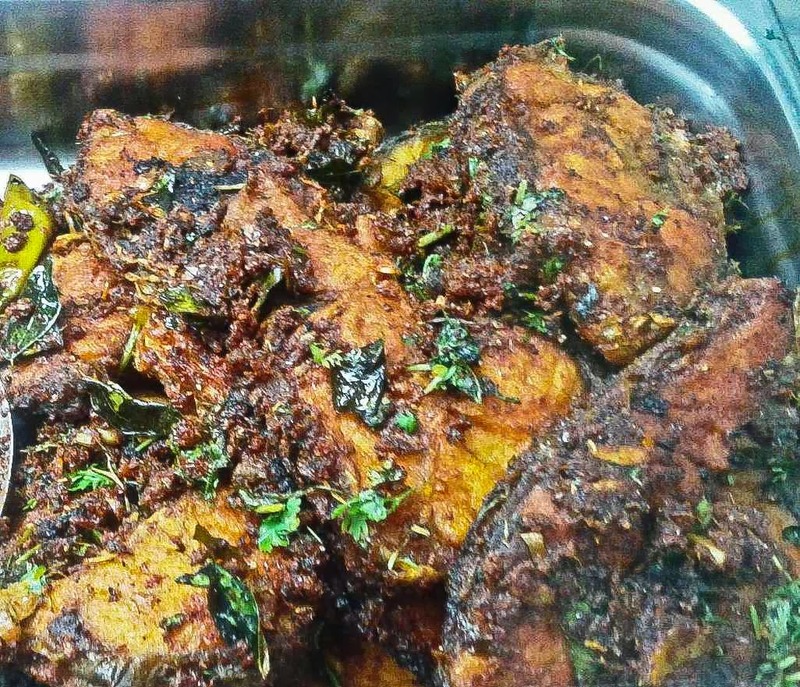 They normally have more than one variety of fish like rohu, korameenu and pandu gappa. The chicken leg roast is another item to be tried. 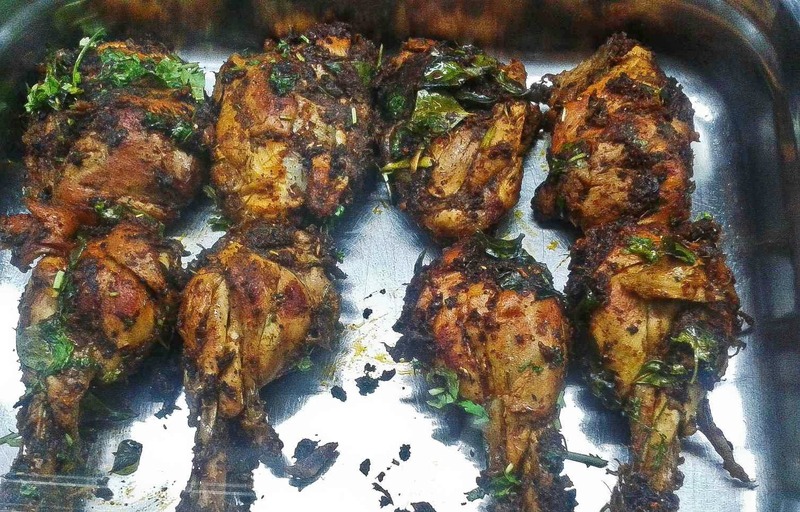 The chicken is well cooked and the masala is a perfect complement to the succulent chicken pieces. 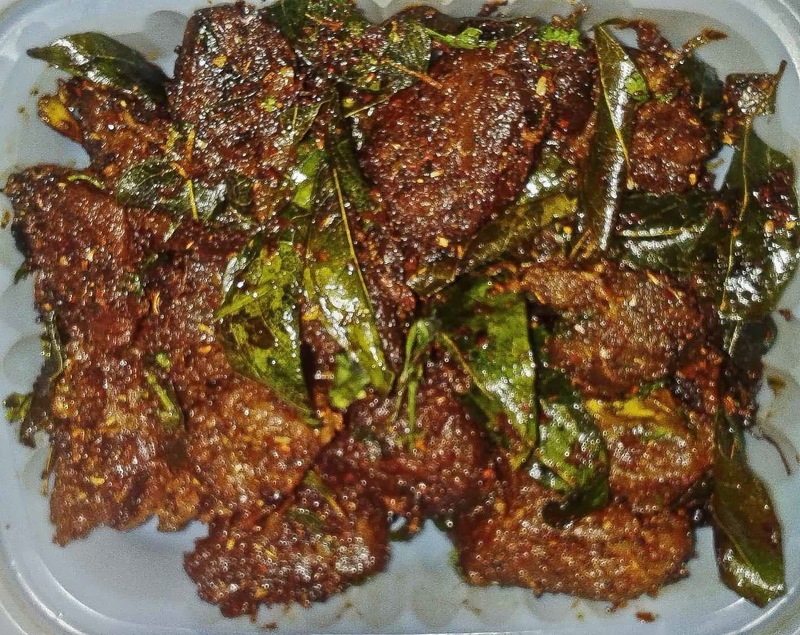 Among the gravy items, Gongura Mamsam, a mutton cooked gravy of sorrel leaves and Kodi Pulusu or chicken curry is also available. 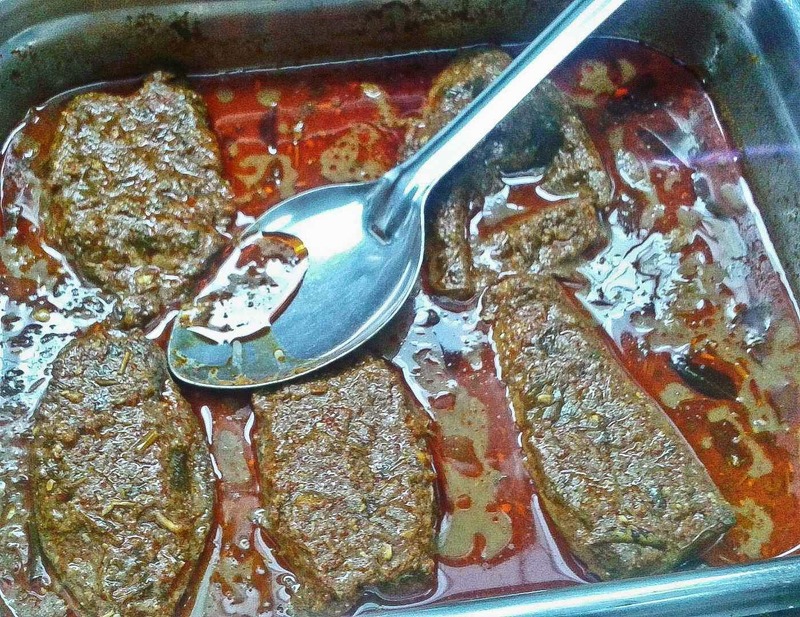 Try their Mutton Liver Fry- you won't regret it. 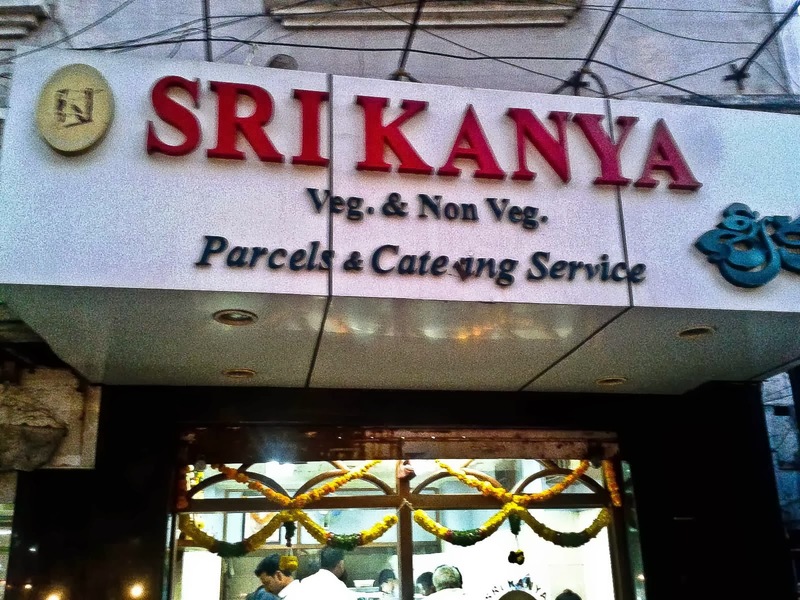 Sri Kanya is a must try joint for Andhra food in Hyderabad. Normally the popular items get over early in the evening, so reach early to avoid disappointment. Most of the items are extremely spicy, so do not try their food if you cannot withstand an extra dose of chili. Their lack of choice for vegetarians and the fact that the place does not accept credit cards are to be kept in mind while visiting. That sounds really interesting. Only that it is very far from where we stay and is in the heart of traffic chaos. But worth a try once , for the takeaway benefits. Very nice blog and thanks for the information you have provided. Hyderabad is a city of foodies. Weddings Planners/Event managements will take care of all the things in wedding including the food, catering services.